“That’s where everything starts,” a fellow Arashi fan warned me while I was spazzing about BIGBANG’s We Like 2 Party. Out of curiosity and for the sake of informed opinion, I’ve been giving BB a listen. But not until WL2P that I could relate to their music. Let’s just attribute it to different music preferences. I do like TOP and GD’s personalities. I like GD’s devil-may-care attitude and I was surprised to discover how he is goodlooking without the popstar styling. (I also like Kiko, so yeah, sue me.) Meanwhile, TOP has been cracking me up with his Instagram posts and how he replies to fans there. He’s a troll and I like my idols like that (I guess it’s true, tell me who your idol is and I’ll tell you who you are, or something like that; so I direct you to…Arashi). I’ve also seen some comparisons between Arashi and BB…I guess because of their dorky personalities. Though BB strike me as grown-up crazy boys, and next to them, Arashi look like innocent kids who know nothing about the ways of the world. And I mean that in a good way for both groups. I just innocently clicked on a link. It was Bang Bang Bang first. Not my kind of jam. So I moved to the next song, which happened to be…WL2P. It’s just my kind of music: happy and poppy. As if that wasn’t enough, the MV had to be made of crack too. The live version is equally jjang. I’ve been playing the song the W.H.O.L.E. day. It’s still on loop as I type this post, blasting through the sound system in the flat I hope I don’t disturb my neighbors. It’s Friday anyway and you know…we like to parteeeey ey-yeah-yeah-yeah. This is where it starts, you say? P.S. I’m hoping someone does a mash-up of WL2P with Arashi’s Welcome to our Party. That would be perfect for a house party. 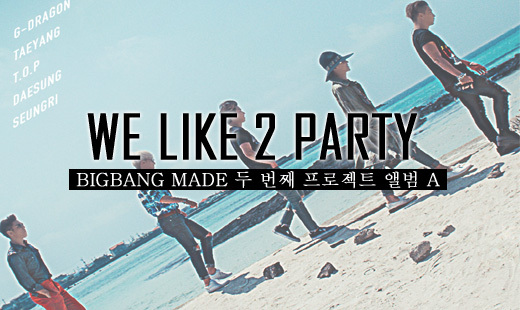 I’ve never really paid all that much attention to BB, though I’ve liked some of their songs, but I love We Like to Party! It’s such a happy, fun song – puts you in a good mood and the MV does make you crack up, as does the M!Ca video. 🙂 The fans must be happy that they can finally see Dae Sung’s eyes again, LOL! deshou?! it’s really a happy song! ahh curses. i forgot to bring headphones w/ me to work. i wanna take a listen. i’m excited its been a while since ive gotten into BB. if a fellow arashi fan, and a nino one at that, says its good then it must be lols. THIS!! Somehow i keep watching their new releases and every time i wonder if there’s something wrong with my music taste ‘cuz everyone’s so crazy about them and i just couldn’t dig their music. At least now i can say i like WL2P, lol. I’ve been a Big Bang fan since 2011 and they have awesome songs. When I first heard WL2P, I thought it did not sound like a BB song and sounded more like a song from 1D..I was kind of disappointed but when I saw the video and the live performance, I ended up listening to it a lot. Try listening to some of their past hits like Haru Haru, Heaven,Blue and Lies. A Big Bang concerts is a must see for Kpop fans..they are electric onstage. The best concert experience for me actually. It’s nice that you like Big Bang.and CNBlue and Arashi. I like them too. Maybe WL2P is not really BB kind of music but I love it..I like CNBLUE and start to like BB, because of good boy GDYB.